…Last October I started a Journey altar, a special table in my bedroom where I have been putting some of the more significant objects and art concerning my TAG Journey. This helped me a lot to keep in touch with my original idea, and sustained me in my vision as the months passed. It helped to keep me in touch with my story telling too. 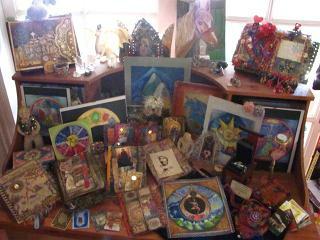 Here is a picture of the Journey altar at the end of September 2011.